Thank you for the outpouring of love and support as we faced our first MBC progression diagnosis. It’s been a crazy couple of weeks – hosting 500+ friends for Hope Scarves annual event, Colors of Courage (a huge success… more on that below), soccer tournaments, scans, doctor appointments, phone calls, more scans, escaping to Maine for a family adventure in Acadia National Park and now today… sitting at the airport in Washington DC on my way to a speaking engagement… finally at a point where I can reflect and write. Original diagnosis was of MBC progression in my right hip and left femur. Additional scans ordered to measure the left femur and determine any structural issues that we needed to mindful of. An x-ray and consequential MRI revealed that the “spot” in my femur wasn’t cancer after all. woot- woot! GOOD NEWS!!! So, then we were “only” dealing with progression in my right hip – which is quite different because it is limited to just one spot. Similar to my original MBC diagnosis with one spot in my sacrum in 2014. This is known as oligometastases and opens up the idea of a local treatment option. Soooo, after three consultations we have decided to radiate the hip and stay on my current medication (Arimidex). Then, scan again in 3 months to see if there is more progression. If not – we will stay on my current medication as long as we can… until there is progression. I have a very high quality of life on my current medication and am thrilled to be able to hopefully get more time on it. I have a radiation planning session on October 24th and will begin radiation on Halloween (spooky…). I will have three rounds, every other day. The hope is the radiation kills all the cancer cells that have become active and I can get my body back into a state of No Evidence of active Disease. (NED). If at my three month scan we find more active cancer than we will look at a systemic change of treatment. I am at peace with this decision and deeply grateful. This diagnosis awoke in me a fear that I had pushed deep into my soul for nearly 5 years. It also revealed a deep hope and steadfast commitment to living life over cancer that helped me not lose my laugh or my smile this time around. I believe people and experiences come into our life for a reason. The week before my progression news I spent time with my friend Emily who was planning to be our featured storyteller for Hope Scarves’ annual event, Colors of Courage. Her experience facing leukemia had taken a very discouraging turn and she wasn’t well enough to join us for the event. So we recorded her message with a video crew. Being in her presence was an enlightening experience. She was facing devastating news, she had endured years of toxic treatments and months away from her family in inpatient care hundreds of miles away from home. All to find out the cancer was still growing and treatments weren’t working. Yet, here she sat – beaming hope and light. I mean literally, this beautiful woman radiates. Together we talked about life, mortality, children and fashion. You can read more about our connection in The Voice article published in advance of our event. So, when news of my progression hit and the weeks of fear followed – I channeled Emily and her light. At Colors of Courage we honored Emily. Her story brought deeper meaning to the event and a greater purpose to our gathering. Following Emily’s lead we laughed, hugged and celebrated life. And, we passionately spoke about how hope shines brightest in the darkness. Hope isn’t reserved for those who “beat cancer” or are “cancer free.” Hope, love and light are there for all of us – no matter the circumstance… if we choose it. Each day you have a choice to live and love and embrace the day. Emily showed us this in her glitter hospital gowns and colorful headwraps. She can’t control what cancer is doing to her body but she can control the way she lives her life – and she gives and receives love more deeply than anyone I know… even as she enters Hospice care. We shared her video, three of her friends spoke about what it meant to send her a Hope Scarf and what she means to them… and then we turned out the lights in the event space. In the pitch black darkness, we asked our guests to donate to RESEARCH… and when they did we asked them to turn on the light on their phone. We live streamed the program to Emily at home and together lit up the darkness in her honor – a hundred points of light shining in the darkness – representing over $70,000 in donations in under 10 minutes! The event raised over $180,000 in total – our most successful event yet. But, success wasn’t just measured in dollars. It is measured in the support we showed Emily, in our shared stories of living life over cancer and creating light in the darkness. I will carry this light with me always. And, I am certain I would have experienced this progression differently had Emily not been part of my life. 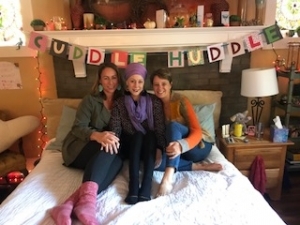 I spent time with Emily this week in an area she named “the cuddle huddle,” a spot in her living room where a comfy bed has been set up complete with twinkly lights and colorful pillows. 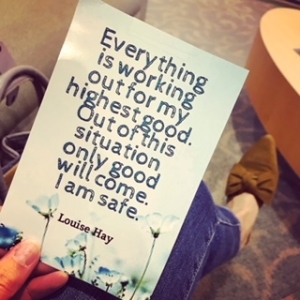 An hour away from a doctor appointment I hoped would confirm my treatment plan, I was nervous. We talked and laughed and shared stories from the event. She encouraged me repeatedly. As we were getting ready to leave she took a small card off her bulletin board. On it, a mantra she has carried with her since her diagnosis. As she pressed it into my hand – she looked me in the eyes and said she didn’t need it anymore. She knew the words by heart. She was passing it on to me, knowing it would bring me the same strength it did her. I am safe. Emily is safe. Hope, safety and joy are not reserved for those who are “cancer free” or “beating cancer.” This was something I didn’t understand several years ago. My happiness hinged on the success of treatments. Of course we celebrate good news and stable scans. 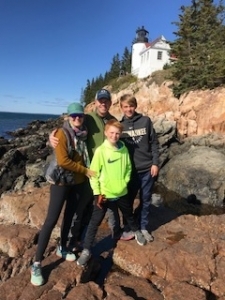 We raise money for research to accelerate treatment options and help people live longer… This is what we all hope and pray for… but, hope isn’t reserved for those who have put cancer behind them. It shines brightest in the darkness. Thank you for your support and encouragement. Thank you for loving us and following my story. The best is yet to come!